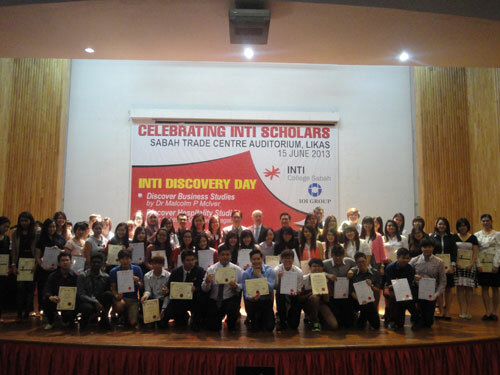 Over 300 secondary school students received inspiration to become well-rounded and highly-motivated individuals, and gained insight into business and hospitality education by participating in INTI College Sabah (ICS)’s Awards Ceremony and Discovery Day at Sabah Trade Centre, Kota Kinabalu. The Awards Ceremony, which acknowledges the hard work and accomplishments of ICS’s high achieving students, recent graduates and student leaders showcased excellent role models that school children could look up to and emulate. These ICS highfliers had not only excelled academically in their studies but also performed outstandingly in their extra-curricular activities. ICS’s close industry partner IOI Corporation was at hand to present the IOI Most Outstanding Student Award to deserving recipients from ICS’s School of Business and School of Hospitality. The IOI Award is a testimonial of the long-standing relationship between the institution and IOI Corporation, and industry recognition of ICS’s excellent track record in producing high quality students and employable graduates. True to its name, ICS’s Discovery Day presented an opportunity for school students to learn about the many academic and career options available in business, accountancy and hospitality. Dr. Malcolm McIver, an established and well-respected member of the international academic community with over 25 years of experience in working with higher education institutions across the globe, presented on the unique business and accounting degree programmes available at ICS. Currently the Director of Studies for University of Hertfordshire (UH) in Malaysia, Dr McIver spoke on the advantages of acquiring a prestigious degree from the UK’s leading Business-facing university without having to leave the country. INTI’s close ties with UH span more than a decade and INTI is the first international Associate College of the University in Malaysia. Apart from the BA (Hons) in Business Administration, INTI College Sabah offers the BA (Hons) in Accounting (3+0) in collaboration with UH. Insight into dynamic hospitality education and industry was provided by Gobien Selva, Operation Supervisor with the School of Hospitality at INTI International College Subang (IICS). Gobien, a FHM Malaysia Culinaire award winner who also lectures for the Blue Mountains International Hotel Management School programme at IICS, shared his perspectives on how the right qualification – such as ICS’s Certificate in Hotel Operations and Diploma in Hotel Management – can lead to challenging and rewarding careers in the booming hospitality industry. 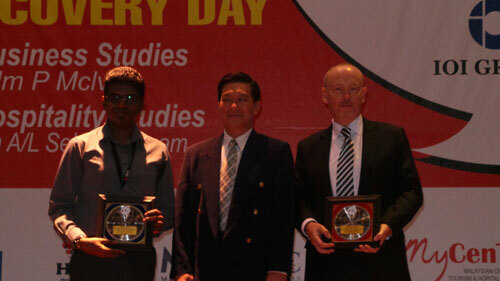 ICS is the Malaysia Center for Tourism & Hospitality (MyCenTHE) cluster leader in Sabah. As the cluster leader, ICS is responsible for transforming Sabah’s hospitality and tourism education programmes to meet first class standards.